We do not curently have theatre tickets available for Star Shaped Festival 2019. This could be because we have simply sold out or it could be that this show is no longer running. The information on this page remains purely for historical and informational purposes. Star Shaped Festival returns for its fourth year! Having become known by fans and artists of the Britpop era as the must-see event of the year, it’s back for another all-day marathon of live music, with the resident Star Shaped DJs bringing the party before, between and after the bands. 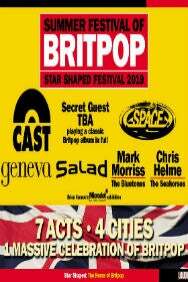 This year the festival takes in four cities across the UK and is delivering a line-up that’ll have Britpop fans rejoicing, so come along and celebrate one of the greatest eras in music.